Here’s a fantastic little indie flick from writer/directors Kevin and Michael Goetz. 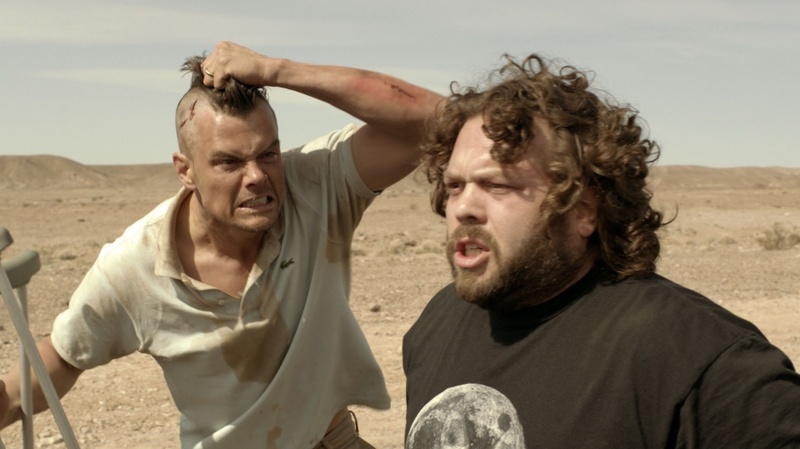 It stars Josh Duhamel (Safe Haven, Transformers) and Dan Fogler (Fanboys, Take Me Home Tonight). 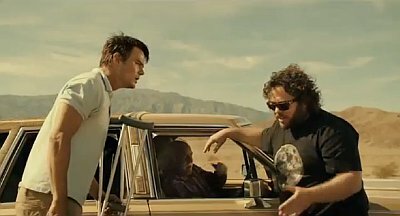 The two of them are taking a road trip together and Carter (Fogler) decides to take “the scenic route” and their truck ends up breaking down. They get stuck in the middle of the desert with hardly any food and water and nothing but vast wasteland in both directions. Mitchell (Duhamel) is more established and evolved than his long time buddy which is the derivation of conflict between them. Carter is jealous and bitter about the success Mitchell has had, and rips on his wife for a good 20 minutes, being unable to let go of his affinity for Mitchell’s previous fling that was apparently way better. They each go off on little tirades concerning each other’s lives which end up driving them to a pretty gnarly brawl. From there it’s a survivalist tale, the two of them battling the elements, the conflicts between each other and from within. They struggle to survive and each step of the way they are met with brutal counter intention leaving you throwing your hands up into the air. Now, I have read several bad reviews on this flick. Many critics call it boring, or claim the dialogue to be over the top and unrealistic. On the contrary, I felt as though because of who these characters were, and how their back story was developed the dialogue fit just fine. Another thing that is being bashed on was the acting. What?! I have been a fan of Josh Duhamel since Life as We Know It, in which I thought he was pretty great. His performance in this one is worth defending. I felt like he channeled some seriously convincing desperation and internal anguish throughout. As far as Dan Fogel, you’ve never seen him like this. I for one was thrilled to see him in something where his character is actually his age, giving him a chance to really show what he’s got. In my opinion, he succeeded. I didn’t know if he could really bring emotion and drive to the screen but damn he did. The two have surprisingly well balanced chemistry and play off each other nicely. Finally, the ending was scrutinized by some. Here’s my biggest disagreement. I loved it. I will say that I saw it coming, but not by much and I was more impressed with how it was shown. I thought it was a perfect conclusion to the story and left me thinking afterwards. What else could you want in an ending? Listen, it’s a good time. If you like these actors, if you like stories of perseverance and the exploration of the human condition, and you just want to have a good time watching a movie, go get some!